Youth choose to leave what they consider home for a number of reasons. Some may need a “time out” or some distance between themselves and their problems. Many remain close to their homes and stay away for only a short time, while others run farther or stay away longer. Of the runaway youth who call the National Runaway Safeline, 46% do so within 1-3 days of leaving home. While running away may feel like a youth’s only option at the time, the emotional and physical risks they encounter are often worse than life at home. At the same time, the reality is that for some youth living in unhealthy or dangerous situations, leaving home may be the best option for their well-being. Here at the National Runaway Safeline (NRS), we strive to help youth find support systems and resources they can count on throughout their crises. Our goal is not to stop youth from running away, but rather to empower them to make a decision by helping them consider their reasons for wanting to leave, identify their options for help and safety, and develop a plan that most suits their needs. 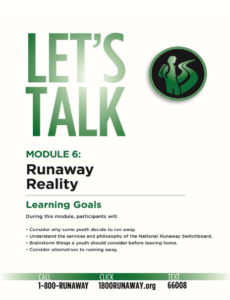 Module 6: Runaway Reality gives youth a chance to explore data about youth who run away, discuss issues that runaway youth face, and even hear a real story of a runaway. This module also allows participants to brainstorm considerations of being on the streets and alternatives to leaving home. Pop Quiz! Youth of what age call NRS most often? In 2016, 30% of youth in crisis who contacted NRS were 17, followed by 16 year-olds at 21%. Giving youth a chance to learn about some of the statistics we gather through our 24-hour hotline, 1-800-RUNAWAY, is a great starting point for them to learn about some of the issues our callers face. They will focus on facts such as who calls NRS for help, how youth support themselves on the street, and if they have run away before. Let’s imagine you are planning on running away. Where would you go and how would you be safe? While the National Runaway Safeline is non-directive, we still make a point to conduct a reality check with youth about how to be safe if they leave home and if there are alternatives to leaving. In Module 6, youth get a chance to do the very same by brainstorming ideas with their peers about things to do instead of running and questions to consider if they did decide to leave. It’s also a great outlet for them to be creative by making their own art and posters out of these ideas. During this time youth also get to explore the story of Augusta, Gone. This is a true story written by a mother whose daughter frequently runs away. Youth will have a chance to explore this relationship from both the mother and the daughter’s perspective. It’s a wonderful way for youth to get a glimpse into what emotions and struggles a parent may be going through when their child runs away and a reminder about how our actions can affect others. Another important story we’ll explore in this module is Mia’s story. This is not a true story but it does give youth a chance to experience another story about how a young girl who runs away survives and the risks she encounters on the streets. This story covers tough topics such as sexual abuse and human trafficking but gives youth an opportunity to identify red flags as Mia’s story unfolds. These aren’t easy topics to talk about but unfortunately, these risks are the reality for so many runaway and homeless youth. We want youth to be safe, to be able to identify potential risks before they happen, and know that there are safe places and resources out there if they should ever need them. Between 1.6 and 2.8 million youth run away in a year. The issue of runaway, homeless and at-risk youth impacts all communities and it’s important to provide an outlet for youth to learn about the risks runaways face, alternatives to running away, and ways to be safe. Another way for youth to learn more about NRS and what we do is a Kids Call. 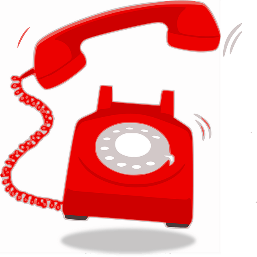 This add-on activity to Module 6 allows youth to hear straight from the NRS front line team of staff what types of calls we handle on the hotline and how we support youth and families who reach out to us. If you are a facilitator or teacher and interested in setting up a Kids Call, please contact NRS’ prevention specialist at 773-289-1723 or prevention@1800runaway.org.